On Friday, October 5th, hundreds of college radio stations will come together to celebrate the unique medium of college radio. The Core is proud to count ourselves among them! 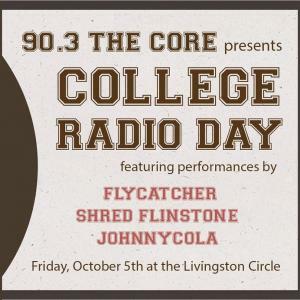 Come out to the Livingston Circle (behind the Livingston Student Center) from 1-4 PM and enjoy some live music from local acts Flycatcher, Shred Flintstone, and Johnnycola. We hope to see you there!